A liposome is a tiny vesicle, can be thought of as a hollow sphere whose size ranges from 30 nanometers to 10,000 nanometers or 10 microns, made from phospholipid molecules made which are the same molecules that comprise cell membranes. Liposomes can be filled with drugs, and used to deliver drugs for cancer and other diseases. 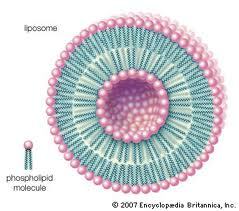 Liposomes can be prepared by disrupting biological membranes, for example by sonication. Phospholipids in liposome are amphipathic, that is, part of their structure is water-soluble (hydrophilic or water-loving) and the other part is oil-like which made of a long hydrocarbon chain (hydrophobic or water-fearing or fat-soluble). Therefore, when added to water, the water-soluble part of the phospholipid interacts with the water and the oil-like part of the molecule avoids the water. In a cell, one layer of heads faces outside of the cell, attracted to the water in the environment. Another layer of heads faces inside the cell, attracted by the water inside the cell. The hydrocarbon tails of one layer face the hydrocarbon tails of the other layer, and the combined structure forms a bilayer. This bilayer extends itself in water to form a sheet which then curls into a liposome. Liposomes smaller than about 200 nm usually only consist of one bilayer (unilamellar liposomes) but larger liposomes can contain concentric layers of lipid (like an onion) or several smaller liposomes can be formed inside large liposomes. These larger multicompartmented liposomes are known as multilamellar liposomes. The interior of liposomes is filled with water and therefore, molecules which are soluble in water can be encapsulated in the interior of the liposome. 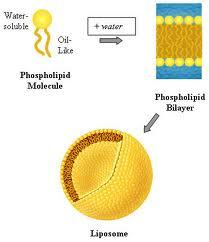 A less recognized but very important property of liposomes is that molecules which are not water soluble, or oil-like, can be entrapped in the oil-like portion of the phospholipid bilayer. Consequently, liposomes can serve as carriers for all types of molecules including both water-soluble and water-insoluble compounds. In fact, a single liposome can carry both types of molecules or combinations of each type of molecule. The lipids in the plasma membrane are chiefly phospholipids like phosphatidylethanolamine and phosphatidylcholine. Liposomes can be composed of naturally-derived phospholipids with mixed lipid chains (like egg phosphatidylethanolamine) or other surfactants like DOPE (dioleoylphosphatidylethanolamine). Non-phospholipid components such as cholesterol, fatty acids and other lipid soluble molecules such as vitamin E are commonly can be added to liposomes.